Turkey will experience one of the most crucial electoral battles in its history on Sunday 24 June, as the winner of the elections will take on a post with large executive powers, handed to him by the voters in last year’s constitutional referendum. Recep Tayyip Erdogan is the favorite to take the 50.1 percent required to win; but the percentage he must win is large and some political analysts predict that he will be forced to take on Muharrem Ince in a runoff vote. Under the new constitution, the new President of Turkey will be able to issue decrees with the force of law, appoint the government and vice-presidents as well as supreme judges. He will also have the power to dissolve Parliament and lead the country to early elections. In these elections a key issue that concerns voters is the economy of Turkey showing signs of a possible crisis. Growth of 7% may have been announced, but the sharp rise in interest rates that the Central Bank had to declare to stop the devaluation of the Turkish lira is expected to bring down growth rates sharply. Whoever is the winner of the elections will have to take drastic measures. In 2002, Erdogan came to power after the 2011 economic crisis and remained in power because of the right economic policy that tripled Turkish per capita income. At this crucial turning point for the Turkish economy, the President promises he could succeed again. The question is whether the Turkish voters will trust him once again. The main rival of the Turkish president is Muharrem Ince, a secondary school physics teacher who is the candidate of the main opposition party, the Republican People’s Party (CHP). 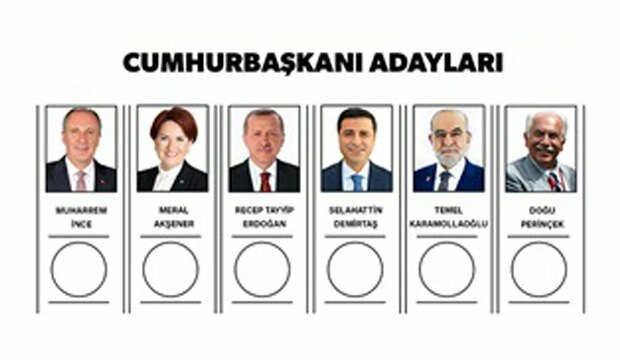 Turkish “wolf” Meral Aksener is also running in the election. She is the head of the new nationalist party, Iyi, and is popular among both young people and working class Turks. With her insistence on running, Aksener is the one that changed the plans of the opposition parties to unite behind a single candidate, Abdullah Gul. Her decision effectively facilitated Erdogan’s election campaign. The president of the pro-Kurdish HDP party, Selahattin Demirtas, who remains incarcerated in an Adrianople prison for 20 month is also a candidate and is running his campaign from his cell via the internet. Temel Karamolaoglu, the leader of the Islamist Party of Wisdom (SaadetPartisi), is also a candidate and has emerged as a major critic of Erdogan despite the fact that his parties share the same ideological roots. The Turkish constitution requires parties to have won at least 10% in the vote nationwide in order to enter parliament, a law which favors the larger parties. With the new constitution, alliances can be formed, therefore, smaller parties cooperating with large ones will be represented. The HDP, which is not participating in any alliance, should exceed the 10% threshold. If it fails, the majority will go to the AKP-MHP coalition. What is certain is that Erdogan will secure most votes on Sunday; but there is a chance he will not be elected in the first round. Then, a runoff presidential vote will be held 8 July. His likeliest opponent will be Muharrem Ince and then Erdogan will enter a second round with his traditional image of the sovereign and undefeated being dealt a serious blow, according to Kemal Kirisci of the Brookings Institution. “For the first time we go to elections without a definite result. With Ince, the CHP’s rates are increasing for the first time, but an impressive retreat of Aksener is being noted. Demirtas is not rising. It seems now that the 24 June elections will have many surprises that we will find out what they are when the ballots boxes are opened” says Abdulkadir Selvi in Ηurriyet newspaper. In these elections, what new voters will do is also important. A total of 1 million young people aged 18-19 will vote for the first time. In these elections the total number of voters is 59.3 million, Sedat Ergin tells Ηurriyet. In the 2017 referendum, Erdogan lost his strongholds. A total of 48.65% of voters said “yes” to the constitutional reform advocated by the Turkish president, while 51.35% said “no”. It was Erdogan’s first defeat in Istanbul since the day he was elected mayor in 1994. In the election campaign his staff put their weight on Istanbul, a city with a population of 17 million. The second target is Ankara, where Erdogan lost again for the first time after 1994 in 2017 as 48.87% said “yes”, siding with Erdogan. In the last few months, Erodgan used internal party procedures to remove the elected mayors of these two cities from their posts, as “punishment” for the defeat and in hope that he will overturn the result in these elections. The result of his decision will determine the outcome.